Susan is one of those people who is consistently present when something is going on around town. Be it a Zero Waste session at the library, the Charlottesville Solidarity Vigil on the common, a Green Homes tour, or many other events, Susan is there. So I went to talk with her. 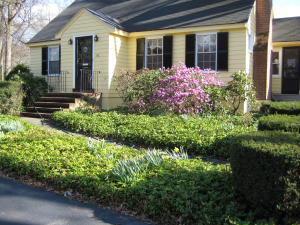 Her traditional cape house is easy to spot as you go up her street – it stands out like a happy spring flower in yellow with evergreen pachysandra all around the front and sides. Inside, Susan welcomed me to her cozy kitchen with a cup of tea, and had laid out a couple of printed pages listing all changes she has made in her living to be a greener citizen. Wow, that’s impressive! How did she do it? Well, for one, she is committed – “I think of myself as a person who cares, so that means I should make changes if they can be beneficial” – and for another, she does it with others, with community. Although her commitment to the environment goes back to the 1980s – after reading Diet for a Small Planet by Frances Moore Lappé Susan started eating lower on the food chain – a big change came in 2008, when she joined an EcoTeam. An EcoTeam is a small group of friends and/or neighbors who get together six times once a month, and go through an eco-cleanse of the household following the practical guidance of an EcoTeam handbook. Each month, a different topic is tackled: water use, energy use, waste, travel, and so forth. At each meeting, you share how things are going with the others on your team. Plus, doing one thing at a time made it all easier: “When you do one thing, you realize it’s not a big deal. Then you have energy for the next thing.” But I think it’s also doing it together that helps. Outside of her own household, Susan also creates change together with others. She had a career as the director of membership at the Trustees of Reservations. When she retired, she took a walk with a friend to discuss what to do, and her friend said, join the League of Women Voters. So she did. There, she eventually became the president (she is currently membership chair). The League and Green Needham often work together because of the two groups’ shared focus on climate change. She also (successfully) ran to become a member of town meeting, after seeing a green initiative go down while sitting in the balcony as a spectator – because she figured she’d rather be a part of the group of people making decisions. In fact, Susan says, “It’s basically what I do. I socialize with friends, and I am an active member of organizations and groups that I care about.” Community.